As we ran out to the Gypsy Queen on our crappy dinghy we began to get apprehensive. It really looked rough. The fiberglass sides were incredibly oxidized and the caprails (rails around the edge) were brown and faded with too many coats of varnish. 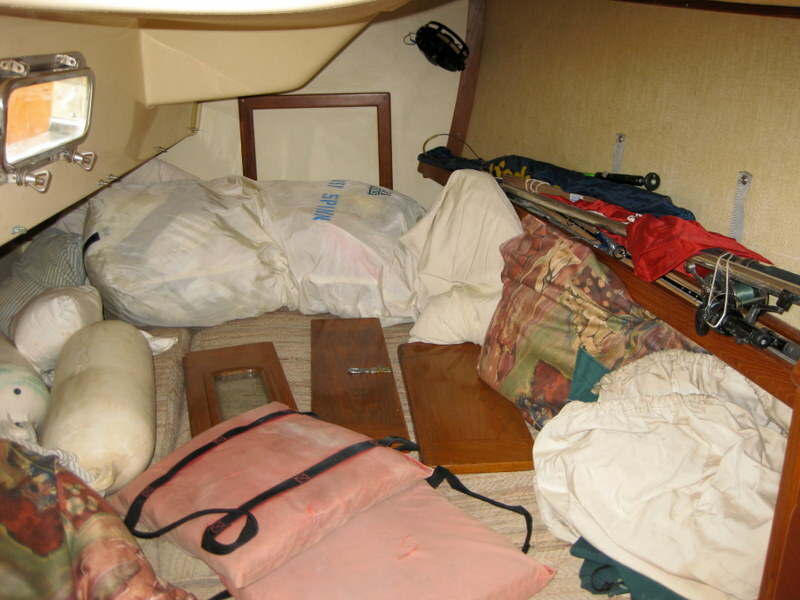 When we got on the boat, everything was stained, faded – the stainless steel was dull and splattered with paint. Down below, the woodwork looked awful from too many coats of varnish and oil. Pieces of trim were missing and everything was dirty. The cabin sole was bashed in near where the table leg fits. There was evidence of lots of half assed repairs. I know there are businesses that “stage” your home when you go to sell it. This boat badly needed “staging.” There was a half-full bottle of spaghetti sauce in the fridge with a layer of mold on top. We were incredibly disappointed with the looks but tried to keep an open mind. We looked at the generator and worried about the process of either removing it or fixing it. The water maker was stuffed in a locker with pipes and tubes all over. The lockers were full of Bob’s and the previous owners’ stuff. It was really disappointing. 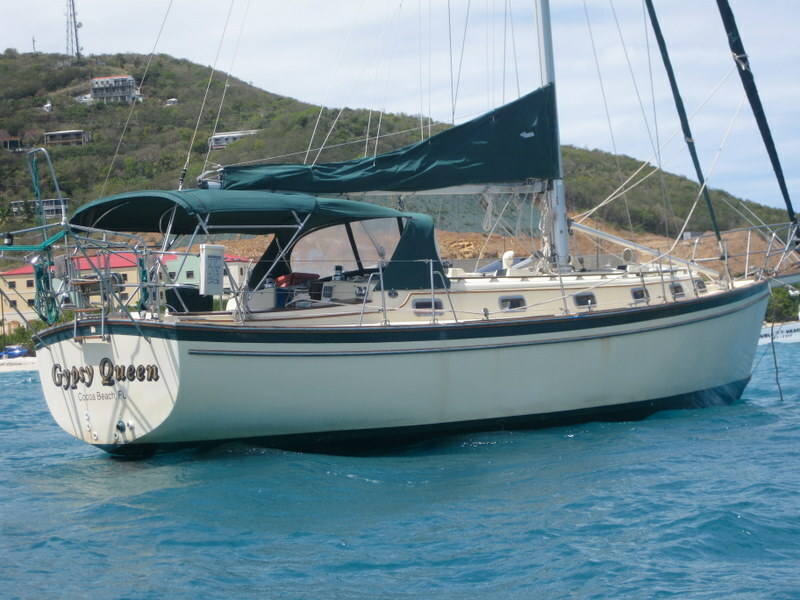 We took it out for a sail and it performed ok. 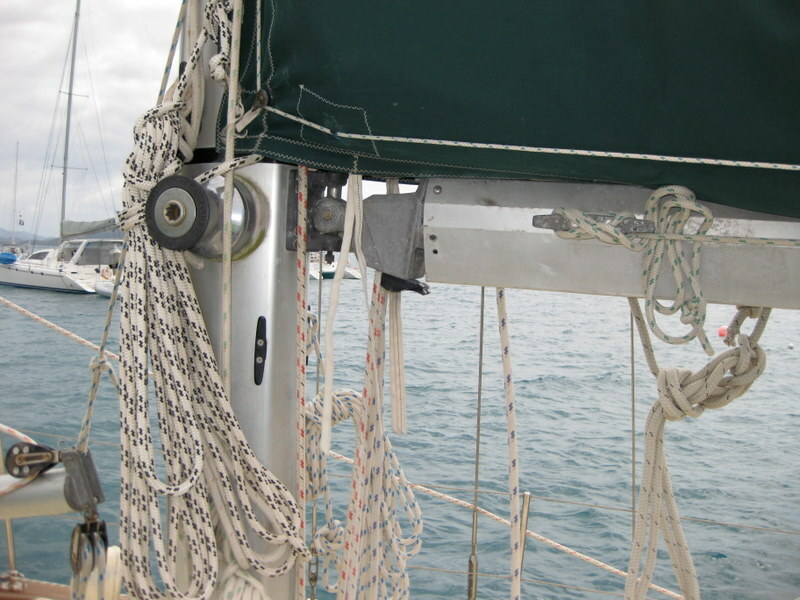 I looked at the place where the boom connects with the mast and it was hanging on by 2 screws – missing 4 others. There was rust... or paint embedded in the stainless standing rigging. It was quite breezy and the boat really heeled over a couple of times - more than I might have thought. We didn’t put up the staysail. I was wondering how the headsail would work coming about around the staysail but it seemed to be OK. Half of the engine instruments didn’t work, the knot meter didn’t work and the wind speed indicator was hooped. Coming back, some of the owner’s boxes skidded across the floor and knocked off another piece of teak trim. You could see that it had been previously repaired… poorly… like everything else. After we got back and the skipper probed for our approval, we realized that we were not going to move forward on this boat. Our suitcases have masks, snorkels, water shoes and other things we were going to leave on the boat. We really thought we were going to buy it. But no. Now we have a huge sense of relief that we aren’t going to be faced with the substantial repairs that are necessary before this boat is something of which to be proud. We are going to make a holiday out of this… and keep looking.